Like many Metis alumni, Max Farago came from a career quite different than data science. He worked for nearly four years as a lawyer – even running his own practice – and is now a Data Engineer at PreciseTarget, where he’s one of two people with a data background at the retail-oriented startup. 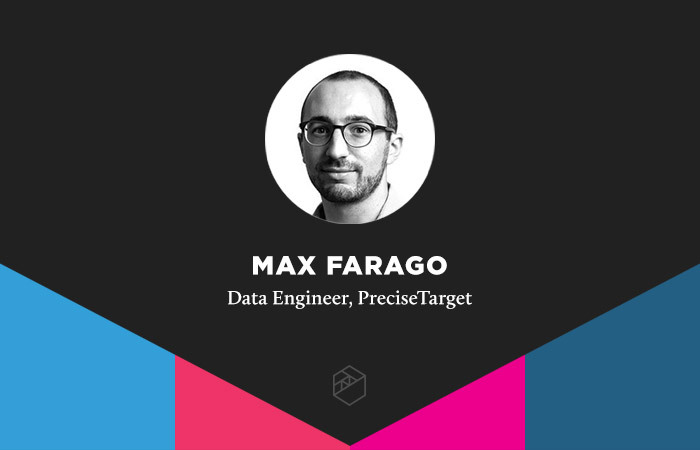 Farago’s day-to-day work involves wearing multiple hats due to his data expertise. One of his most important tasks is overseeing the collection and munging of data. Before making the switch to data science, being a lawyer was satisfying to a certain degree, but not entirely. Farago was bogged down with office work and didn’t appear in court as much he would have hoped. And while running his own practice, income stability was a persistent problem. He officially quit his job the following year and spent the next several months brushing up on his stats skills while also learning Python in preparation for Metis. His goal entering the bootcamp was to make an absolute shift into data science (not to become a lawyer who uses data science). But he left room for some overlap throughout the bootcamp. Farago was able to apply his legal knowledge to projects. For an NLP project, he used topic modeling to find themes in court opinions, and for his final project, he created a real-time legal advice web app called Pocket Lawyer, which matched user questions about legal issues to relevant answers and articles. Now at PreciseTarget, he’s working on building a multi-class classifier with NLP. The goal of this project is to match each clothing item with its correct category on a web app. These sorts of challenges keep things interesting for Farago, who says he has absolutely no regrets about the career switch and that he has everything he wants out of his current career. Curious to learn more about our Data Science Bootcamp? Check it out here! David Luther had been on the road for nearly two decades, touring with musical acts like Meat Loaf and Dweezil Zappa, singing and playing saxophone, keyboards, and rhythm guitar to sold-out crowds around the world. But in time, he began to crave a change. Read how he arrived at our Chicago bootcamp and at his current role as a back-end developer for the Perduco Group.